In the normal order of things, we'd expect that higher-order insects - such as wasps and bees - would be predators on lower-order insects, like flies. And this is normally the case e.g. Ichneumons. This fly, however, attempts to redress the balance somewhat. 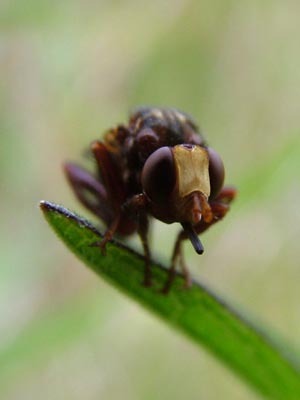 Sicus ferrugineus is parasitic on Bumblebees. The female catches Bumblebees and 'staples' an egg upwards into the bee's soft abdomen. You can just see the upwards-pointing ovipositor in the top left picture. The eggs hatch out and the larvae eat the Bumblebee from the inside. Recent research indicates that the parasitised Bee has an altered pattern of feeding, visiting different flowers than would usually be the case. Perhaps this altered pattern of feeding is more suitable to the Sicus larvae. The lower picture shows it poised to pounce. It reminds me somewhat of a lion. A pretty beast. This is Autumn Hawkbit - Leontodon autumnalis - a clear sign that summer is progressing. The rear shot shows the red colouration of the underside of the outer petals, although this is sometimes absent (I had to examine a few before I found a decent red example). My white Bush Vetch is also making seedpods, and you can see that some of them are developing normally. Cinnabar Moth larvae are in great numbers this year. I hadn't noticed that they are hairy. This is the pupal case of the 10-spot ladybird. I'm deducing that from location and size: The Beetle had already flown. Devilsbit Scabious - Succisa pratensis - has nearly opened. It's one of the last of our local flowers to appear.